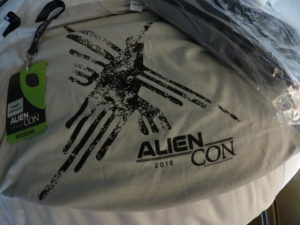 Over the weekend of October 28-30, I went to the first AlienCon in Santa Clara, California. It was put on by the folks at Prometheus, the producers of Ancient Aliens on the History Channel. Here are a few of the highpoints and the lowpoints of the weekend. When we arrived at the Santa Clara Convention Center, Friday morning, the place was already packed with people. We walked through the lobby and you could feel the excitement of all the excited attendees, some people were grouped together laughing while others were having very serious conversations of the paranormal. 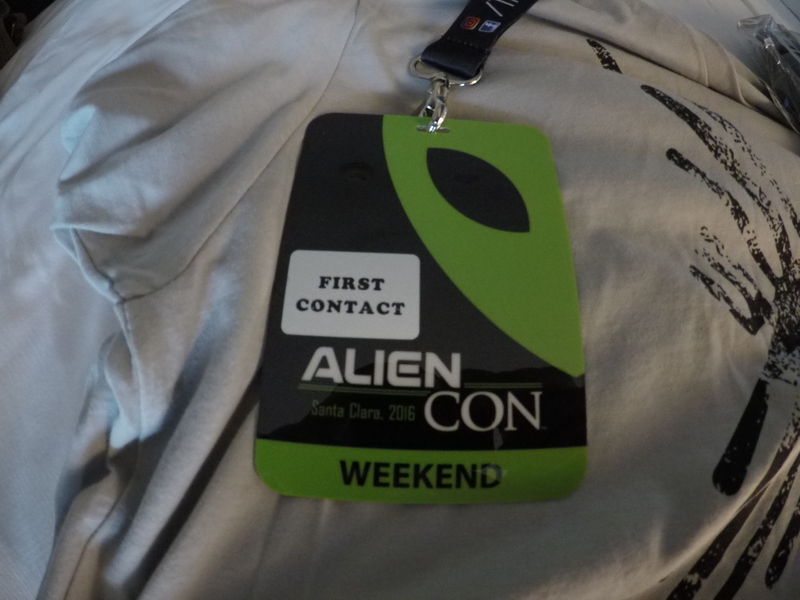 We were not able to get the VIP passes for the weekend, as they had sold out, but we did get the next best package which was the First Contact package. 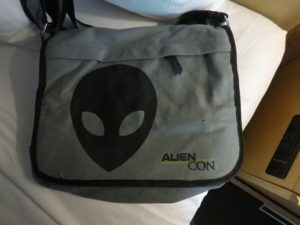 This gave us a tee-shirt, and a very nice, usable shoulder bag. The disappointing thing is it didn’t really give us much else. I talked to a few of the VIP folks, and they said the only additional bonus they received was a meet and greet with the Ancient Aliens cast. They did say that that made it well worth it. The VIP pass didn’t however get the owner to the front of any lines for the panels. Right away we could tell that the organizers of the event miscalculated the interest this Con generated. The lines into the panels were an hour or two wait, and a lot of people got turned away from panels after the wait because the room was at capacity. I heard some people complaining about the vendors area saying that there were too many non-alien related booths. I didn’t mind this however, because it reminded me of a comic-con vendor area, lots of cool art, artists, authors and other collectable goodies. The few panels we made it into were only an hour long, and they had several expert guest like David Childress, Linda Moulton Howe, Giorgio Tsoukalos and others who could easily give an hours worth of enthralling lecture solo. So each would only get to barely scratch the surface of their areas of expertise. Still, it was fascinating to hear each of them drop their nuggets of collected experiences and knowledge. One of the coolest parts of the weekend was just sitting in the hotel bar enjoying a beverage and Giorgio would walk in, then Childress, then Linda Moulton Howe, and just chat it up. As we were sitting there, the actress who played Kaylee in Firefly (Jewel Staite) and the actress who played Starbuck in Battlestar Galactica (Katee Sackhoff) walked up to the bar together and visited with each other over a drink. Very cool. With all of the hiccups over the weekend, I do have to say that I really appreciated the promoter of the event getting up in front of us before a panel was to start, and accepting full responsibility for the mistakes of the weekend, and promising to learn from these errors to make next year even better. I will be there to check it out!